Stephen Downes has written a summary of chapters 11-14 on the blog he uses for his longer writing: Half an Hour. If you have the remotest interest in learning and have not yet signed up for his free (as in freedom and beer) newsletter, then you are doing yourself a disservice. I’ve reproduced his summary below. Please note that Stephen licenses his work under a Creative Commons BY-NC-SA licence. Numbers, he writes, grip us and keep us in their thrall. The driver toward unlimited growth, the pleasure of being among the masses – these both illustrate an anti-intellectualism that has long been subject to the suspicions of the rational among us. The power of number can be contrasted with the light of reason that is the hallmark of the written word. Because numbers represent a form of pre-literacy and pre-civilization, it may seem off that someone like Oswald Spengler in ‘The Decline of the West’ express concern with ‘the new math’ as a retreat from numbers, and specifically, the rise of non-Euclidian geometries and the rise of functions in number theory. But, argues McLuhan, the primacy of literacy isn’t the the primacy of reason, it is the primacy of the visual sense. But the primacy of the literal isn’t the the primacy of reason, it is the primacy of the visual sense. And the fragmentation of civilization results not from the rise of science and mathematics, but from the elevation of one sense over the others. The fragmentation occurs when we isolate properties that can be detected visually, but are beyond the reach of the other senses. Indeed, the modern properties of numbers are not derived from primitive society at all. As Tobias Dantzig writes in ‘Number: The Language of Science’ “the parity or kinesthetic sense of these [primitive] people is stronger than their number sense.” They counted in terms of “One, two, heap.” The new math Spengler railed against resulted from the introduction of key ideas of language to numbers, specifically, “correspondence and succession.” The awareness of zero, and of infinity, in particular, have their origins in the application of ideas from language to numbers. “Clothing,” writes McLuhan, “as an extension of the skin, can be seen both as a heat-control mechanism and as a means of denning the self socially.” Changes in clothing reflect changes in society. For example, post-war Europe emphasized fashion and style at the same time American society seemed to be revolting against it. Europe, in turn, had its own revolution in the late 18th century as the courtly dress, once vastly different from the peasant style, was replaced (sometimes by necessity) by more common attire. Clothing, when presented as an object of art or sculpture, represents a society that is visually oriented. But the new styles are reflecting a society that is incorporating all the senses once again. “In a word, the American woman for the first time presents herself as a person to be touched and handled, not just to be looked at.” It is now easy, says McLuhan, to see clothing as an extension of the skin. The birth of money as commodity is well known, with McLuhan relating examples such as the use of whales’ teeth on Fiji or rats on Easter Island. Even in literate society, commodities may be used as money in extreme circumstances, with the trading of jewels and cigarettes, for example, common in occupied territories. In the age of paper currency, money becomes less personal and more sterile. The modern use of money is tied intrinsically to literacy, and with literacy “money, as a social means of extending and amplifying work and skill in an easily accessible and portable form, lost much of its magical power” (as money becomes more like a language, and less like number, money becomes more literal and less sensual and tactile). The phrase “money talks” resonates because money is a communications medium. We have seen already that money is a storehouse of communally achieved work, skill, and experience. But just as the clock separates time and space, money separates work from other aspects of human experience. “Time is money,” it is said, and money is the storehouse of time spent at work. In primitive society, money has intrinsic value, and the whole concept of ‘work’ doesn’t exist. But in literate society, money is a means of storing and transferring ‘work’, where ‘work’ begins with the division of labour and the role of money is enormously increased after money begins to foster specialism and separation of social functions. Money both fosters and represents this transition from a cohesive and unified society to a literate, fragmented, separated one. Definition of consciousness as interplay among our senses. Recognition of the similar interplay between extensions of our senses. Stated need for social, electrically ordered consciousness that can comprehend the complexity of dynamics of extensions and stay “in touch” with totality of them. Need to overcome alienation caused by mechanical technologies that extended beyond our reach of touch. Statement that dominance of visual (fragmenting) mediums give way to instant, organic, electric integration. Ambivalent longing for tribal culture. Interplay between the mediums / extensions.One medium takes a lead for a period of time dictating not only developments of other extensions but also dictating the structure of human inner life. (e.g. print & Renaissance painting → idea of infinity → infinitesimal calculus & drive for growth). “The effect of any kind of technology engenders a new equilibrium in us that brings quite new technologies to birth….”Senses have ability to translate into each other through “common sense” = Greek “consensus”. Similarly, extensions have the ability to translate into each other as well. McLuhan stresses an acute need for outer, communal, consensus that can consolidate, make comprehendible the dynamic interplay among extensions. He dreams of electrically ordered world-wide social integration – universality of conscious being for mankind. “Our mechanical technologies for extending and separating the functions of our physical beings have brought us near to a state of disintegration by putting us out of touch with ourselves”.“What we have today, instead of a social consciousness electrically ordered, however, is a private subconsciousness or individual ‘point of view’ rigorously imposed by older mechanical technology. This is a perfectly natural result of ‘culture lag’ or conflict, in a world suspended between two technologies. McLuhan defines consciousness as interplay among our senses. “…consciousness is itself a ratio or proportion among the sensuous components of experience, and is not something added to such sense experience.” This puzzled me, because I’m a believer, in systemic principle – no system can be explained thoroughly from within the system, it requires an external factor playing into it. Locked system becomes a swamp. I wouldn’t preach in favor of intervention of “cosmic visitors”, but I wouldn’t buy into the McLuhan’s closed definition either. What are your thoughts on this? He alludes to what that new form of shared consciousness can be. In chapter 11 he talks about “infinity of functional process” (Spengler) operated by computers that provides extension to our nervous system in electrical technologies. Does he talk about artificial intellect? Would the world, where staying in touch is “outsourced” to an artificial intellect, still be a world of human species? Think “Matrix” or “Lawnmower Man”. How do you feel about this kind of world and this kind of “evolution”? “…The instant character of electric information movement does not enlarge, but involves, the family of man in the cohesive state of village living.” Does it? It does give access to information but does it necessarily spark the new sense of touch, the new consciousness that McLuhan calls for? “Both time (as measured visually and segmentally) and space (as uniform, pictorial, and enclosed) disappear in the electronic age of instant information. In the age of instant information man ends his job of fragmented specializing and assumes the role of information gathering. Today information gathering resumes the inclusive concept of “culture,” exactly as the primitive food-gatherer worked in complete equilibrium with his entire environment.” What is the meaning of information gathering in non-specialised world? Extension of touch, ability to reach out and grab distant things.“The mysterious need of crowds to grow and to reach out, equally characteristic of large accumulations of wealth, can be understood if money and numbers are, indeed, technologies that extend the power of touch and the grasp of the hand.”Number has power to set up drive toward unlimited growth. Industrialization and mass production accelerated the role of the number. How about ancient need for security? Comfort of being wrapped in own kin. Not to be grabbed. Touch as most intimate and interrelated activity, necessary to integral existence, key to consciousness. “… not just skin contact with things, but the very life of things in our minds”.Evolution of number:Number in ancient world is magically associated with physical things one can reach out to. It blends mystery and tactical manipulation. It is a symbol. Science (“shadow of number”) tended to reduce things to numerical quantities. Number becomes a tool – compressed image, result of visual abstraction. Binary system of electric age doesn’t need writing. Instant speed and scale of information processing makes visualization impossible. Linearity and point of view are not necessary in new mathematics and physics. What does number become in this world? Since we’re into this computing / electric technology for several decades now do we indeed witness departure of visual dominance? Interaction with the (social) environment. McLuhan particularly elaborates on how dress design and architecture carry a message (are a message) of self-expression adjusted to the common, dominant sense (dress for an eye vs. dress to “be handled”). Clothing & Housing”… shape and rearrange patterns of human association and community”. Translation of fundamental understanding of reality into human space (e.g. tribal home as embodiment of the cosmic image, or church building as embodiment of understanding the divine). According to McLuhan this relation got broken with the rise of visual era as visual segregation and social specialization call for compartmented utilitarian space. “After centuries of being fully clad and of being contained in uniform visual space, the electric age ushers us into a world in which we live and breathe and listen with the entire epidermis”. Modern engineering provides flexibility that comes close to natural, organic, and has potential to bring us closer to the tribal cosmic unity. Throughout the chapter 13 McLuhan talks about electric light. It’s another good example of interplay between mediums and its two-way influence on our inner life. McLuhan defines money “as a social means of extending and amplifying work and skill in an easily accessible and portable form…” It has visual dimension – separates work from other social functions and, like writing, translates one type of product / work / skill into another. It also has tactical (numeric) dimension – the power to reach and grasp distant things, power to extend space. Money depends on communal participation and at the same time shape communities by facilitating exchange (social interdependence) and by altering social order (accumulation and distribution of surpluses). As with mathematics, printing prepares the ground for fixed-priced economy by “… psychological conditioning in the ways of uniformity and repeatability”. I very much agree with and treasure the opening sentence here. But I really can’t picture (hahaha) the electric, tribal, non-specialized work. Are we there yet? Are we heading there? Anybody has an example? Is it about all people going creative and doing what they love, while outsourcing all the unloved jobs to developing world / robots / clones? “Today, electric technology puts the very concept of money in jeopardy, as the new dynamics of human interdependence shift from fragmenting media such as printing to inclusive or mass media like the telegraph”. Well, physical expression of money is in jeopardy (e.g. I rarely have cash in pocket nowadays). But I’m not so sure about the concept of money. Didn’t internet banking rescue the concept for electrical age (for good or for ill)? My favorite quotation from these chapters: “For the specialist is one who never makes small mistakes while moving toward the grand fallacy”. Summarizing McLuhan isn’t an easy thing to do. It’s like biking in the sand. I couldn’t agree more! I have therefore decided to just use these chapters to frame two questions. The spoken word does not afford the extension and amplification of the visual power needed for habits of individualism and privacy. One native, the only literate member of his group, told of acting as reader for the others when they received letters. He said he felt impelled to put his fingers to his ears while reading aloud, so as not to violate the privacy of their letters. This is interesting testimony to the values of privacy fostered by the visual stress of phonetic writing. Such separation of the senses, and of the individual from the group can scarcely occur without the influence of phonetic writing. The literate man or society develops the tremendous power of acting in any manner with considerable detachment from the feelings or emotional involvement that a nonliterate man or society would experience. [..] Phonetic culture endows men with the means of repressing their feelings and emotions when engaged in action. To act without reacting, without involvement, is the peculiar advantage of Western literate man. It can be argued then, that the phonetic alphabet, alone, is the technology that has been the means of creating “civilized man” –the separate individuals equal before a written code of law. [..] Only the phonetic alphabet makes such a sharp division in experience, giving to its user an eye for an ear, and freeing him fom the tribal dance of resonating word magic and the web of kinship. Are we losing our individualism nowadays? Becoming less repressed? Will the way we communicate change the fundamental fabric of our societies? It is a persistent theme of this book that all technologies are extensions of our physical and nervous systems to increase power and speed. McLuhan saw transportation as communication. It is quite predictable, [..], that any new means of moving information will alter any power structure whatever. [..] Speedup creates what some economists refer to as a center-margin structure. Paradoxically, the effect of the wheel and of paper in organizing new power structures was not to decentralize but to centralize. A speedup in communications always enables a central authority to extend its operations to more distant margins. The question I’d like to ask my fellow readers is the following: are we mistaken when we think that the net will help democratize our society? Should we aim to slow down our interactions if we want to give people more say and agency? Back in chapter 6 (p.57 in my edition) McLuhan introduces the idea that spoken word is the first technology that allowed humans to consider themselves from an outside perspective. He builds on this idea in Chapter 8, which is a little more than 3 pages long. McLuhan uses two examples to show that spoken experiences are much different than written experiences. Spoken word experiences are participatory, sensuous, unified, dramatic, and involved. Such orally based cultures even have a distaste for silence, and a strong affectionate characteristic, as illustrated by the travel guide to Greece excerpt. Contrasting this, the phonetic written experience values privacy, separation of the senses, and the individual. McLuhan goes so far as to claim that individualism cannot occur without the written word. It is the speed or the automatic nature of the spoken word that affords situational reactions not only of language but also of tone or gesture or action, separating it from the detached, emotionless phonetic experience. At this point McLuhan steps back and flips the script a bit. He considers the spoken word, or language itself, as the first fragmentation of humans – as written word is to speech, so is speech to instinct. Taking from Henri Bergson, he explains how the development of language increased consciousness of the individual at the expense of the consciousness of the collective mankind. The uniqueness of language, with its ability to contain style, created individuals. McLuhan ends the chapter with a paragraph about how electronic technology has strong implications for the future of language, or, for a future without language. Electronic technology holds the potential return to some type of collective unconscious. How would a future collective unconscious differ from the past collective unconscious? To what extent is spoken word (language) an extension of man as opposed to a definition of man? Chapter 9 starts with an anecdote that shows the effect of the written word and how exciting this can be to discover. However, there is also much anxiety attached to this effect as the Western world has developed a dependence on the phonetic alphabet. The electric age foreshadows an end to this dependency. And the end may be abrupt, like a carpet pulled from underneath, because Western civilization hasn’t spent enough time trying to understand these effects. Written words lack the emotional qualities that spoken word experiences contain. Yet, the individual and the ‘citizen’ arises more distinct from literate cultures. Tribal cultures also cannot accommodate a sense of linear progression; literate cultures act without reacting, act faster, transfer action, and apply knowledge. The myth of Camdus shows how this type of control that the technology of phonetic writing affords had shifted ancient power and authority into military hands. The phonetic alphabet cultures have produced many successes, but it is merely one view of the world, one way of existing consciously. It assumes a linear cause and effect worldview that can be challenged at its core. The next few paragraphs are challenging to summarize, as McLuhan restates some of his earlier points, and I think offers up a summary of his own, of sorts. He claims that the phonetic alphabet is the initial step in humans’ ability to be calculating, to have autonomy over their individual self (that emerged with the development of the spoken word in Chapter 8). This ability has been most notable (and perhaps he implies ‘surviving’) in the idea of military, that he mentions throughout the chapter. Next, he comes back to the idea that it is the unawareness of western culture’s phonetic, fragmented disposition that is the real point behind his explorations. Phonetic technology has the ability to translate between cultures, where as other forms of writing could only separate cultures from each other. The last two paragraphs are a useful summary of the chapter. How do we make sense of the homogeneity, uniformity, and continuity features of the Western phonetic alphabet (p.87) that produce a culture of fragmented, individual, citizens? Chapter 10 is much longer than the previous two chapters, and right away McLuhan explains that the subject of this chapter is the prime example of how to “understand media”. Perhaps the scope of both chapters 8 and 9 are too large, and better addressed in books of their own. Before the telegraph, communication was tied directly to physical travel routes. The rise of military powers and empires were a result of communication routes that allowed people like the Romans to command from a distance. Speed is the major determining factor of communication and command at a distance, as parts of empire (or any system?) will detach and form around faster control centers. Electricity changed all this, however. Speed, like the phonetic alphabet, tends to makes things similar, uniform. Yet, change in speeds are not uniform, and the change brought on by the electric age is causing implosion of fragmented civilization into the global village. And this, McLuhan says, is difficult to understand as it happens. The technologies of pack-animal, roads, aircraft, etc have determined the flow of goods, the division of labor and how people perceive concepts like ‘city’ and ‘country’. This acceleration creates infrastructure problems, which in turn affect human relationships and values. The speed of communication has tends to strengthen central authorities, so that they can expand with greater ease. An increase in village size to city-state also tends to divide labor and functions among the people – the community itself accelerates human activity. With this increase in size comes a certain level of safety, but also numerous problems of competition and intensity of function. The balances of size and function struggle to maintain equilibrium, similar to how the human body tries to remain healthy surrounded by viruses. For example, the Roman Empire saw its decline when communication access in the form of roads were blocked, and the means for distributing the written word were cut-off. It was centuries before another Empire started to make use of communication routes (combined with written technology) in such a way again. And, this use of communication routes has extended into the expansion (and struggle) of Western society into North America. War between countries is again the struggle for equilibrium on a larger scale. With the increase in size of city-state to global-village, countries compete and intensify function. Following war is the demand for better communication routes, and in the 20th century this demand took the form of highways of the mind. McLuhan brings back his earlier point that the electric age, with its leap to the instantaneous, has changed this pattern. It’s as if this jump in speed is an eye to the next level, degree, distinction, collection of area or specialty…the next medium. Near the end of this chapter McLuhan brings up education as an aspect of 20th century society that has been lagging. How have changing communication routes shaped education ‘since sputnik’? Reading chapters 4 to 7 was an interesting experience, a crazy ride that made me at times excited, angry and for moments, also thoughtful. With massive apologies for the delay, here I would like to share with you some points I found important. Yet, as we know, for McLuhan, technology is an extension of man and thus also translation and amplification of ourselves, as he explains in Chapter 6 (Media as Translators). These chapters can also be seen as an ode to artists, which for McLuhan, are the only members in our society who can truly comprehend the present beyond its fragmentation and see the effects of technology before they are experienced in wider society. As you can imagine, for McLuhan, most of the people are like narcissus- unable to grasp what technology is, nor its complex effects. We create and adopt technology into our lives as a way to respond to irritations- either experienced by our bodies or minds (thus wheel was invented to counter-irritate feet). However, by doing that we ‘amputate’ the organs or ‘displace our perception’ from the senses over which now technology takes over entering a numb and narcotic state. That is why he calls media ‘make happen’ agents rather than ‘make aware’ agents, because technologies are developed before they and their possible implications are thought over (as an example of such technology he gives language). Yet, McLuhan argues that “We can, if we choose, think things out before we put them out.” He identifies that such moments, when we escape the narcosis state is when two different technologies meet and interact and suddenly we can see/experience the peculiarity of the technologies (Chapter 5: Hybrid Energy). While this happens when different cultures meet, on a more regular basis such moments are created by artists who mix media to create certain effects (e.g. Chaplin’s mix of ballet and film). In Chapter 6 McLuhan also lays down the basic premises of what we have come to know as knowledge economy- one where “all forms of wealth result from the movement of information” and human lives are understood in terms of continuous learning. Here it seems that McLuhan is not entirely sure which direction this development might take, since one side of the story could be increasing information overload, while the other one might be a return to tribal man state where technology is understood in terms of magic. And here McLuhan hits a soft spot for me. Because, indeed- how well do we ‘understand’ and ‘know’ the technology we use? Me myself, I think I rarely understand anything much beyond of ‘automagically’. My blog post is automagically uploaded after my email automagically was sent to Hans, and while I know how to make that happen, is my understanding any deeper than the one if I attributed this exchange to be performed by some sort of gods or spirits? Last week I participated in a workshop aimed at increasing my understanding about how the Internet works. The basic premise of the organizers was that it is only by going away from children’s’ book explanations of the Internet we can empower ourselves to become creators rather than consumers. McLuhan himself also seem to have believed that understanding the electronic age will allow him to increase his human agency. So in that workshop I mentioned, we spent a week learning command line, creating networks, secretly observing through our monitors what other people do online, etc. It was a great mix of hands on and learning through discussion. Yet I’m not sure if I really feel the Internet in a different way now. Embodied knowledge, such as riding a bike or walking is hard to translate in words and descriptions, yet we can observe it and we know it, we feel it and we practice it. But what kind of understanding do we need when we deal with abstract networks, structures, and processes, which are hard to be observed and hard to be learned by doing. Since as I understand many of you are interested in learning, I thought maybe you have some thoughts on the nature of arriving at understanding, which for McLuhan is the only way to be authentic human. Ok, and just in case someone else thought of related issues when reading, I want to drop in another question- what would McLuhan think about Quantified Self, especially in the form it takes on quantified-mind.com/ Since I was late with my blog post, I can’t expect we can actually go into this question, but just to give an impression: Quantified Self claims to be a movement where people track various aspects of their lives (eating habits, exercising, sleep quality, etc. ), often through use of technologies that allow to aggregate and analyze their performance. Quantified Minds is a website where one tests the performance of various cognitive processes against different variables such as the time of the day, amount of coffee consumed, etc. I also attended the workshop that Zane refers to. Check this summarizing blog post if you are interested to learn more. These four chapters conclude our reading of Understanding Media Part I, in which McLuhan lays out the basic concepts that guide the reader through his analysis of particular media studies. In them we find an account of “Narcissus narcosis,” the general condition of being subjected to our own extensions without being aware of that subjection. Following that account, we find two chapters about the possibility of escaping Narcissus-narcosis through the media themselves, and one final chapter concerning the challenges we face in this transitional time of literal-visual culture meeting its future in the form of electric media. Drawing on the Greek myth of Narcissus, who becomes transfixed his reflection in a pool of whatever, unaware that that image is an extension of himself, McLuhan describes as akin to Narcissus’ condition our own condition of, through a narcotic numbness, misrecognizing the extensions of ourselves as wholly other entities. Every extension of ourselves, he argues, emerges as the functional amputation of what we extend. For example: the wheel, which functionally extends the foot, functionally amputates the foot with respect to the tasks which most overburden the latter. McLuhan offers the accelerated/accelerating processes of money- and document-exchanging as examples of increasingly intolerable burdens on the foot. It’s worth drawing from McLuhan’s example the hypothesis that the auto-amputative operation of media, such as the wheel, effects Narcissus narcosis at least partly in the way that the new extension is automatically drawn into other media-processes. By this I mean that the wheel, in its involvement in the automobile for example, ceases to appear to us as an extension of ourselves, and starts to appear as an alien agent to which we must submit, insofar as it is tangled up in other processes whose dominating effects on us forced the new media’s emergence in the first place. The n-hour automobile commute that defines so much of North American life, iconized by Los Angeles gridlock, is a perfect example of what I think McLuhan means here. In other words: when we become dominated by our own extensions, we become what McLuhan calls their servo-mechanisms. As McLuhan points out earlier in the book, we extend ourselves as a control-strategy: technologies are attempts to grapple with our environments and to sustain a sort of homeostasis in relation to those environments. The concept of Narcissus narcosis indicates that the price we pay is a loss of control in relation to our own strategies of control. And it seems as though the greatest loss of control we suffer has to do with our awareness of the situation itself. Narcissus narcosis is the process and the effect in which, by which, we “accept these extensions of ourselves into our personal system and … undergo the ‘closure’ or displacement of perception that follows automatically” (Understanding Media, Cambridge: MIT Press, 1994, page 46). However, McLuhan finds a possible source of hope in the emergence of electric media themselves: he ties to them the fact that the twentieth century is the age of “consciousness of the unconscious”. His hope is that we can turn this consciousness of the unconscious back on its own wellspring, electric media, and break the Narcissist stupor. McLuhan begins by summarizing the content of Chapter 4. “It is now been explained,” he writes, “that media, or the extensions of man, are ‘make happen’ agents but not ‘make aware’ agents” (48). Yet “the hybridizing or compounding of these agents offers an especially favorable opportunity to notice their structural components and properties” (49), which can help make us aware of our situation. Following up on his implicit suggestion in Chapter 4 that media emerge and are taken up in relation to other media, as strategies for accommodating the overwhelming effects of other media (wheel—commerce/government, e.g. ), McLuhan argues that each medium has at least one correlate, with the exception of light: “except for light, all other media come in pairs, with one acting as the ‘content’ of the other, obscuring the operation of both” (52). All media, except for light, emerge as meetings of media. “What I am saying,” he says, “is that media as extensions of our senses institute new ratios, not only among our private senses, but among themselves, when they interact among themselves” (53, italics mine). Thus he concludes the chapter by saying that the “moment of the meeting of media is a moment of freedom and release from the ordinary trance and numbness imposed by them on our senses” (55). He offers some specific examples. James Joyce’s Ulysses, which deploys a mythic “Greek” resonance in its depiction of everyday life in 1920s Dublin, unsettlingly re-oralizes/auralizes linear “secular” life. Likewise, McLuhan’s reference earlier in the book to Cubist art shows how painting, which intensified the private point of view by perfecting the representation of perspective, can re-adjust our sense-ratio by representing the total perceptual involvement implied and induced by electric media. Here I think it’s worth referring back to McLuhan’s early claim in the book that media alter space-time arrangements in our senses and in our actual activities: sense-ratios, stripped of their particular characters, are essentially space-time arrangements. The key to understanding how hybrid energy can break Narcissus narcosis lies in understanding how media-hybridity implies multiple space-time sensibilities at once. For example, when cinema speeds up mechanical processes to the point that it can break free of imagery whose logic resembles that of the film-process itself—a sequence of isolated frames moving past us in a linear manner—the limits of mechanism stand a chance of being exposed. Mechanical logic itself is laid bare before us for what it is; no longer a semi-concealed horizon, its own self-surpassing makes it for us an object of possible understanding and intervention. For McLuhan this doesn’t depend as much on solitary artistic geniuses who disclose the truth about the world for us, but rather “by a simple adjustment of situations from one culture in hybrid form with those of another” (55). Thus, McLuhan praises and prioritizes art and artists—in the “scientific” and “humanistic” fields, as he says in Chapter 7, p. 65—as those who seem best able to draw out hybrid energies, to make them perceptible, and to alert the rest of about the Narcissist spell that turns us into servo-mechanisms of media. That is, if new media are counter-irritants that conceal themselves within us and without us, then art can provide counter-counter-irritants; elsewhere, McLuhan calls artistic creations “counter-environments”. Like Chapter 5, this chapter is what I’d call a “possibility” chapter, or an “appraisal” chapter. As with the issue of hybrid media, McLuhan finds in the translating powers of media a weapon against Narcissus narcosis. What does it mean to say that media “translate”? They translate one kind of knowledge into another: translating is “a ‘spelling-out’ of forms of knowing. What we call ‘mechanization’ is a translation of nature, and of our own natures, into amplified and specialized forms” (56). As with hybridity, this translating operation includes the Narcissist danger, but McLuhan finds in electric media a vehicle of hope: “man must serve his electric technology with the same servo-mechanistic fidelity with which he served his coracle, his canoe, his typography, and all other extensions of his physical organs. But there is this difference, that previous technologies were partial and fragmentary, and the electric is total and inclusive. An external consensus or conscience is now as necessary as private consciousness” (57-58). How does the inclusiveness of electric media provide an opportunity to escape narcosis? We have already seen the work that art can do; here, I think McLuhan finds electric media’s capacity “to store and translate everything” (58) comprehensively and at quasi-infinite speed to be quite advantageous. For example, with the advent of electric media, we now have the ability to process and store all the documents and artifacts of sense-ratios prior to, and adjacent to, our own. Moreover, they are in principle available to anyone to be compared and contrasted; that is, to be translated objects and translating agents. “Under electric technology the entire business of man becomes learning and knowing” (58). How does this radical, global, translatability counter-act Narcissus narcosis? By juxtaposing multiple different sense-ratios in the form of their documentary evidence, which are traces of how they act as causes—”causal traces,” perhaps—electric media from this perspective stand to present sense ratios as such as plastic, flexible arrangements that can be adjusted and transformed. If media, in their capacity as translators, are “active metaphors in their power to translate experience into new forms” (57), and the danger of Narcissus narcosis is the deadening of metaphors, the translation of “metaphorical” meaning into “literal” meaning, then the universal storing-translating power of electric media stands to act as a metaphorical life-support system. In other words, electric media offers us the opportunity to establish a “common sense”, a new “rationality” (60) concerning sense. This common sense grasps or apprehends (60) the serial and simultaneous coexistence of many different sense ratios that compose different social and psychic arrangements of human life. “[M]ight not,” he wonders, “our current translation of our entire lives into the spiritual form of information seem to make of the entire globe, and of the human family, a single consciousness?” (61). In this chapter McLuhan offers one last hopeful possibility, and indicates the scope of the difficult translation in which we electrically “re-tribalize”. Drawing on his earlier remarks about hybrid energies and their possibilities, McLuhan suggests the highly “literate” technique of the “suspended judgment” as a strategy for slowing down, or staving off, our Narcissist absorption into the new electric sense ratio. The suspended judgment, which consists in analyzing and describing the effects of new media without concluding whether those effects are “good” or “evil” “presents the possibility of rejecting the narcotic and of postponing indefinitely the operation of inserting the new technology in the social psyche” (63). Simply put, McLuhan holds out hope that we can resist attacking or defending the new media long enough to understand how they transform our sense-ratio. “What we seek today is either a means of controlling these shifts in the sense-ratios of the psychic and social outlook, or a means of avoiding them altogether. To have a disease without its symptoms is to be immune. No society has ever known enough about its actions to have developed immunity to its new extensions or technologies. Today we have begun to sense that art may be able to provide such immunity” (65). Here again McLuhan praises art for its capacity to shift perceptions, and to act against the Narcissist effect by making us deliberately maladjusted to the latter. “The artist,” he writes, “is the man in any field, scientific or humanistic, who grasps the implications of his actions and of new knowledge in his own time. He is the man of integral awareness … thus he can correct the sense ratios before the blow of new technology has numbed conscious procedures” (65). Thus, in the case of cinema, which can present as iconic images of multiple series of events occurring simultaneously, the artists can make us aware of a difference: the difference between the sense-ratio which we don’t know we’re exiting and the sense-ratio we don’t know we’re entering. When we become aware of that difference, we can begin to consciously explore the complexities and challenges elicited by those sense-ratios colliding. McLuhan closes the chapter on a slightly ambivalent note. After pointing out with Arnold Toynbee that “‘geographical expansion is often a concomitant of real decline” (71), McLuhan also says that the very vehicle of our civilizational expansion—that is explosive, literate, visual, mechanical technology—offers, even in the midst of decline, the one-thing-at-a-time consciousness necessary to analyze our electrification bit-by-bit, explode and disentangle its various elements, and to expand our understanding of its operation. If “media-savvy” here would include training in metaphor, translatability, and artistic perception-practice, how might we consider educating our children? Might such an education, especially in a transitional time such as our own, mitigate social violence and a propensity for certain forms of war, since McLuhan sees forms of violence concomitant to the emergence of new media as an “identity quest”? What forms of “art” (in the “scientific” and “humanistic” fields) that group members have encountered and appreciated might count as a “counter-environmental” use of hybrid energy? The example of the ‘light’ bulb’ helped me understand this idea: the light bulb is a medium with a social effect: it enables people to create spaces during nighttime. The light bulb ‘an sich’ is a medium without content, but with a huge effect on the society. Another example is the one of IBM: ‘ when IBM discovered that it was not in the business of making office equipment or business machines, but that it was in the business of processing information, then it began to navigate with clear vision. Question: when we look at social media as a medium in the way McLuhan looks at it, what would be a concrete example of ‘the medium is the message’ for this? Different media invite different degrees of participation. Film and lectures are hot, television and workshops are cool. I notice that I struggle with ‘hot’ and ‘cool’, because my association with ‘hot’ is intense and active, but in McLuhans view ‘hot’ is high in participation. Cool determines more effort to determine meaning, because they are based on one single sense and/or provide little (visual) information. book is hot and makes for less participation than a dialogue. This focus on ‘hot’ and ‘cool’ helps me to look at online learning (my focus in work) to see whether we stimulate participation enough and what are activities that do more. Or less, sometimes! 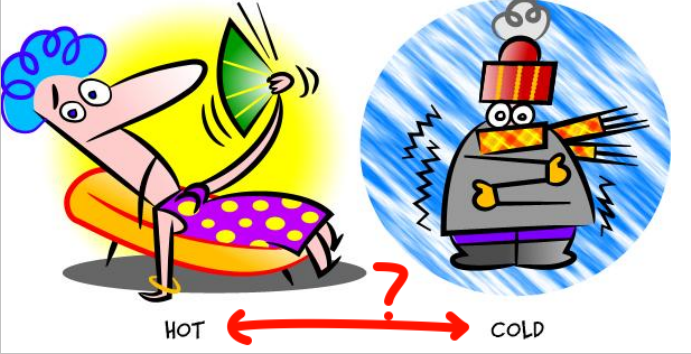 Question: when you use this ‘hot and cool’ perspective to look at your personal learning approach, what does that tell you?